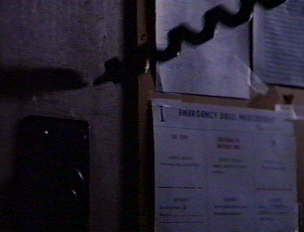 During Linda's (Brinke Stevens) chase scene, you'll spot two deliberate visual gags: flyers stating "Join the Drill Team!" and "Emergency Drill Instructions." 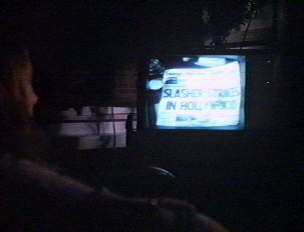 Valerie (Robin Stille) watches Hollywood Boulevard (1976) on TV, which is later shown in Sorority House Massacre 2. When Kim (Debra Deliso) is throwing the little statues at Russ Thorn (Michael Villela), you can spot Rubyfruit Jungle, a book by Rita Mae Brown, who wrote the film. Thanks to Nathan for the above information. Three of the girls sit in the same position in both SPM and Sorority House Massacre 2. In SPM, SPM 2, SPM 3, SHM, and HTD, the characters push something against a door to keep the killer from entering. Michael Villela (Russ Thorn) had a bit part in the 1983 Roger Corman film, Love Letters (aka My Love Letters, Passion Play), which was directed by SPM director Amy Jones and had music composed by Ralph Jones, who did the music for SPM. Debra Deliso (Kim) and Joe Johnson (Neil) starred together in the late-80s horror movie, Iced. Robin Stille (Valerie) and Brinke Stevens (Linda) were in the 1988 horror-fantasy schlocker, Sorority Babes in the Slimeball Bowl-o-Rama. Featured in Dusk to Dawn Drive-In Trash-o-rama Show Southern Style, Volume 2 (1995) and The Coroner (1999). Carol Frank, who later directed SHM, was assistant to the director on this film. Go here for more information on the prologue scene. "The girl lying on the floor in the poster is the late Jillian Kesner. She died tragically young last year [a staph infection, December 5th, 2007]. Only Andre Honore was from the original film. That's not Michael [Villela]. He wasn't there the day we took the photo. As I stated above, that's Jillian Kesner on the floor, then Andre Honore, Bernadette Williams and some unknown chick I remember dating for about two weeks at the time." Further research reveals some interesting facts about Jillian Kesner: she played Fonzie's girlfriend, Lorraine, on Happy Days, was married to director Gary Graver, and was interviewed by Jewel Shepard for Jewel's book, Invasion of the B-Girls. She was also in 1981's Firecracker (a Roger Corman feature) and 1982's Trick or Treats, which Gary Graver directed. Go here for more info on the late actress/model. Bernadette Williams, on the other hand, only made a few TV appearances on Hunter (1985), Crazy Like a Fox (1985), Hardcastle and McCormick (1985), and Better Days (1986). She was also the star of the 1983 WIP flick, Caged Fury. Visit Location Shots to get a bunch of trivia on the filming locations for the film, thanks to Devon and Haley.